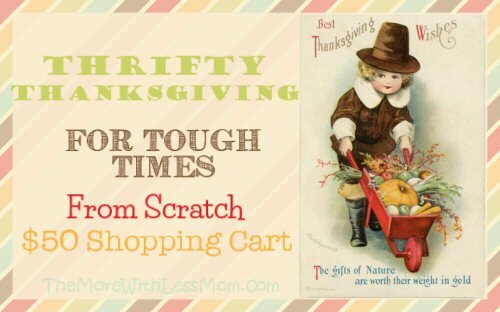 Use this frugal shopping list to spend $50 and purchase staple ingredients for your from scratch Thanksgiving meal, making smart decisions in tough times. This series of articles is designed to help families put a frugal Thanksgiving meal on the table. Don’t forget this is EVERYTHING you need, I assumed your cupboards were bare. The asterisked items are actually over $50, but if I can price match, use loss leaders sales, or just find better prices, I can add these back in and get my pumpkin pie.